One of the best low growing Lilly Pillies, Acmena smithii ‘Allyn Magic’ makes great border plant and is also Psyllid resistant. As a native hedging plant is easy to prune as the foliage is reasonably small and can be grown in containers so it could be used as a patio plant. It will flower in summer with small white flowers that attract bees and birds to the garden. The flowers are followed by small berries. In a well drained humus rich soil, Acmena smithii ‘Allyn Magic’ is a very easy care plant. Dig the soil over well adding a little well rotted compost to poorer soils. Mulch around the plant to maintain a cool root run and prevent weeds. Prune in spring before the new foliage shoots. 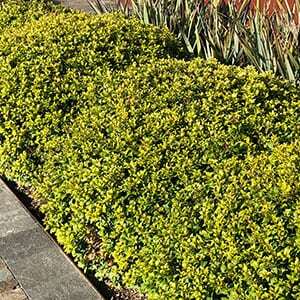 Use a specialist native plant fertiliser in spring to maintain good foliage. If you are planting Acmena smithii ‘Allyn Magic’ as a low hedge, plant at around 50cm apart to 80cm apart depending on the effect required. Foliage – Green with new foliage orange to red. Fruits – Small pink berries. Frost tolerant – Yes, light frosts are OK.